The new Komatsu PC228USLC‐11 possesses many new features, including improved lifting performance with 6% lower fuel consumption, improved operator comfort, increased safety features and leading low in cab noise levels. Its rounded cab design, more compact than on a conventional excavator, allows it to rotate within the counterweight’s swing radius. Operating weights of the PC228USLC‐11 range from 23,600 kg to 24,150 kg. It is powered by a Komatsu SAA6D107E‐3 engine, EU Stage IV emissions certified, with a net horsepower of 123kW at 2,000 rpm. Komatsu’s advanced electronic control system manages the airflow rate, fuel injection, combustion parameters and after treatment functions. Komatsu’s EU Stage IV engine optimises performance, reduces emissions and provides advanced diagnostic capability, enabling customers to benefit from lower fuel consumption with no loss of performance. An integrated SCR (selective catalytic reduction) system further reduces NOx emissions using the AdBlue® additive. Powerful and precise, the PC228USLC‐1 is designed for a wide range of applications. 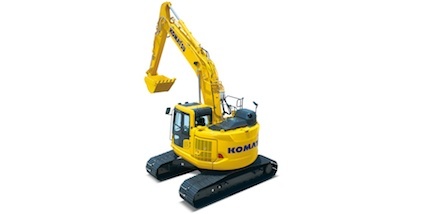 All major components, including the engine, hydraulic pumps, motors and valves are exclusively designed and produced by Komatsu. Larger boom raise cylinders, combined with an upgrade to the arm’s hydraulic circuit, improve the excavator’s lift capacity by up to 21%, with heavy loads being placed easily, in a wider working range. These features enable the operator to get the job done correctly the first time, under any working conditions, thanks to the easy and smooth arm control. A comfortable work environment has been designed to further maximise productivity. Specifically designed for hydraulic excavators, the ROPS certified cab gains strength from a reinforced box structure framework. It is mounted on rubber isolation dampers for low vibration levels, with its sliding cab door enabling unrestricted access / egress to the cab in confined spaces. The radio offers pre‐sets and an auxiliary USB input for connecting external devices. The new viscous fan clutch system reduces both power loss and engine load when maximum cooling is not required. This lowers fuel consumption, and contributes to what is said to be a class leading low in cab noise level of 71dB. Proportional control joysticks are standard, and allow precise operation of attachments with comfort and ease. A new auto idle shutdown helps the machine to further decrease fuel consumption, with the addition of a new neutral detection system reducing the risk of inadvertent operation. A high resolution 177mm (approx.) TFT‐LCD widescreen colour monitor features enhanced capabilities, and displays information in 26 languages for global support. 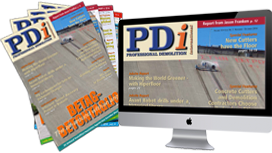 It provides information on AdBlue® fluid level, eco guidance, operational records, fuel consumption history and utilisation information. Safety is further enhanced through Komatsu’s standard ‘KomVision’ system, with display on the monitor of a real time bird’s eye view of the PC228USLC‐11’s immediate surroundings. This helps to avoid jobsite incidents and accidental movement at start up.